In working with QMK, I found that it supports writing in stenography with the help of Plover. Stenography is often used for making court reports, writing closed-captions and real-time transcription. 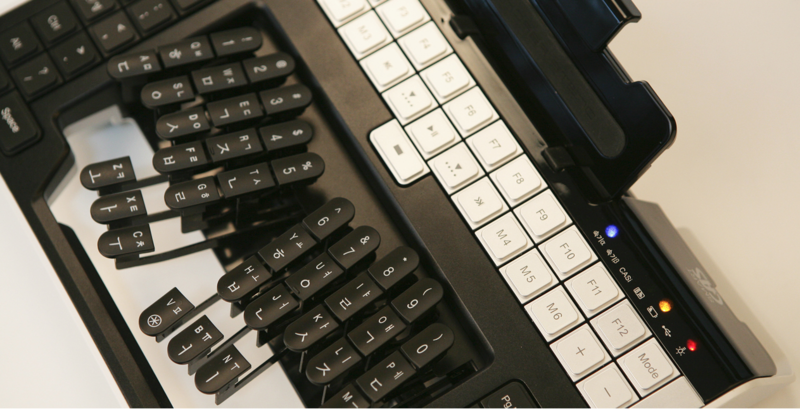 Stenography allows for faster text input because with it, you don’t type individual keys to form words; you type chords, pressing multiple keys simultaneously to form syllables. Normally, stenographers use stenography machines: dedicated machines that make it more ergonomic to press multiple keys at once. They also contain features that make the professional lives of stenographers easier. For up-and coming professionals like students, these machines can be prohibitively expensive, ranging from about $500 refurbished to as much as several thousands of dollars. Thankfully, with the help of open source projects like Plover and QMK, people are enabled to build and use keyboards that the community has built. I think it’d be a lot of fun to make such a keyboard as a personal project. I don’t know a lot about stenography however, and even less about the machines used to write in it. This post is an exploratory post, aiming to collect features that are popular in stenography machines, and features that set some machines apart from the others. The Open Steno Project has produced software called Plover, which translates steno input to human readable text. It does so by listening to the various protocols that existing stenography machines speak. The Open Steno Project keeps a list of Supported Hardware, which contains several stenography machines that are supported by Plover. Not only professional stenography machines are supported: some keyboards are also supported, and there are also some custom keyboards made to specifically support Plover. This lowers the barrier of entry significantly, making stenography a lot more affordable for the rest of us. Note that if you don’t yet own a stenography machine and want to use Plover, acquiring a machine is not needed – any keyboard that supports N-Key Rollover will do. You may already have such a keyboard, so be sure to check out the supported hardware page. Stenography machines can have plenty of features. Some features are found it almost all stenography machines. They’re listed here to get a good picture of what the average machine is capable of. First of all, the key layout of most stenography machines look alike. A machine needs to at least support these keys for it to work as a stenography machine. I won’t explain why this layout exists the way it does: Please read the excellent digital book Art of Chording by Ted Morin. In it, there is also a chapter on the Chorded Keyboard. The conventional Stenography keymap layout, taken from the Art of Chording. Unlike conventional keyboards which use rubber dome switches, or the mechanical switches that are used in mechanical keyboards, keys in stenography machines are most often actuated by means of levers. This allows for a much lighter actuation: where conventional keyboards often actuate with about 50cN, or about 50 grams of force, keys on a stenography machine can actuate with as little as 10 grams of force. This is useful, because stenographers often need to press as much as eight keys at once, thus requiring eight times the force. This adds up: with a conventional keyboard, the stenographer would need to press with a force of 400 grams, or almost half a kilogram! You can imagine that writing at a high speed, pressing with so much force, can be too exhausting for professionals. And then a computer program translates the inputs to text, using predefined rules and a dictionary of known words. Some stenography machines are able to perform all of those steps, and then output the resulting text directly as keystrokes as a normal keyboard would. Most machines, however, need (often proprietary) software to produce text. Thankfully, Plover can perform that job for us, as long as the machine complies with the supported protocols. Note that all stenography machines support something called NKRO: N-Key RollOver. It means that, no matter how many keys you press, all presses will be registered. This is a feature that’s supported only in some conventional keyboards, though most often in gaming keyboards. A basic stenography machine is able to output the keys that are pressed. Plenty of machines I found also support one or more advanced features, providing more abilities than its simpler competitors. They often deliver quality of life improvements for stenographers. 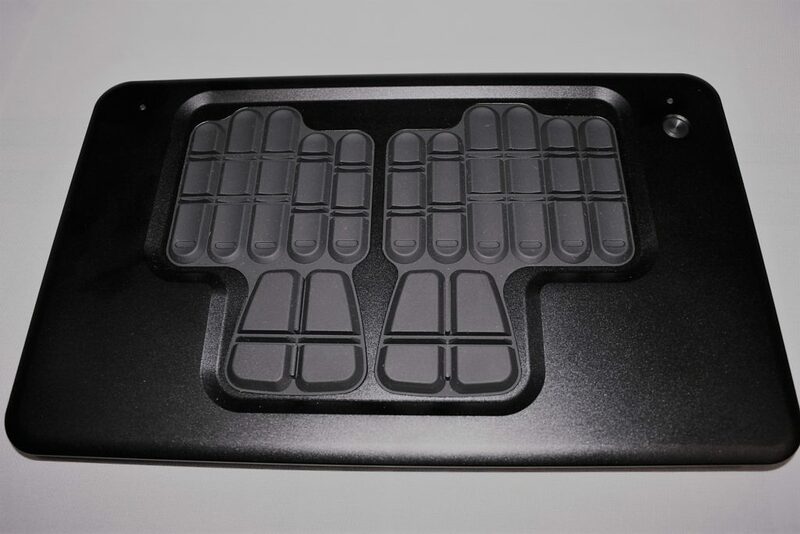 Some stenography machines offer the ability to customize the depth of all keys, or even the depth of each key individually. Some machines may also offer the ability to also change when each key actuates. 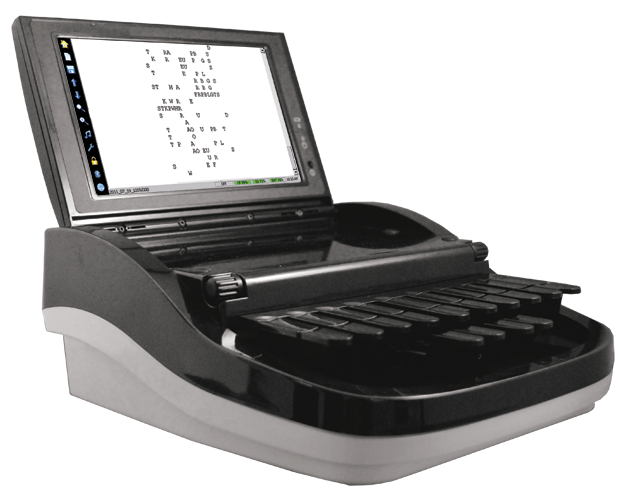 The Elan Cybra, a stenography machine made by Stenograph, offers per-key customizability. Some machines offer the ability to translate stenography chords into text in real-time without the need for a computer program. This is helpful when you don’t always use your machine on the same computer, or when working with a machine that also offers working in a standalone mode. Some stenography machines are able to operate standalone, without the aid of a host computer. They are able to save keystrokes to storage, allowing for them to be retrieved later. Some machines have a limited amount of onboard flash memory, allowing several pages of text to be saved, while others also have slots for one or more SD cards, allowing several gigabytes of data to be saved. 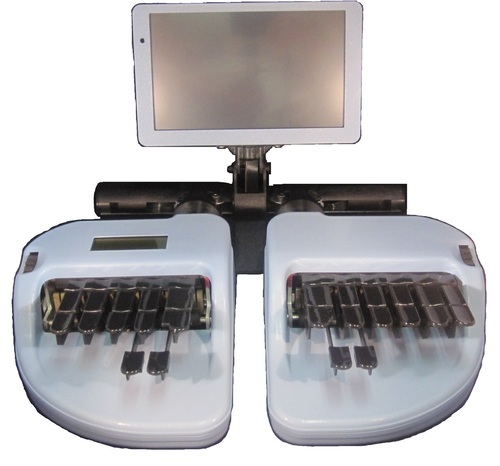 Some stenography machines have a display, which allows the user to view steno as they write. They often offer the ability to view steno that is written earlier as well, sometimes with search functionality. The Blaze stenowriter by ProCAT. If the machine supports onboard translation of steno into text, machines may offer the ability to view the text itself, making reading the text more user friendly. Some machines have a touch screen, acting as both a screen and a pointing device. This makes for more accessible navigation across folders and text files. Some machines that offer a standalone mode also are able to be powered by an onboard or external battery. This means that you won’t be limited to writing in places with a power outlet, providing flexibility in classrooms, meeting rooms or other places where an outlet isn’t always nearby or available at all. High-end stenography machines have the ability to capture audio. This is often saved to a larger storage medium like an SD card, often supporting sizes up to 32GB. If these machines are also standalone, they often support synchronizing keystrokes to the captured audio, making captioning possible. Other machines that do not support audio capture may still support synchronizing captured keystrokes to points in time. Mind that I’ve only reviewed the hardware so far: I’m sure there is computer software that is able to synchronize keystrokes to audio or video. Connect to a host, using an external application to translate the keystrokes to words. Connect to a host, presenting itself as a conventional keyboard, performing the keystroke to word translation on the device itself. Be able to have a host connect to the device to retrieve files made in the standalone mode. The Smart CAS Plus by the Smart Shorthand Company. A few variants on the traditional stenographic machine format are made by Stenovations. They contain as much as 121 sensors, being able to sense not only keypresses but also touches between keys and the force with which you press the keys. Specialized software on the computer then translates those sensor inputs into steno by referencing them against threshold settings, key definitions and macros. This allows for a great level of customizability. The Lightspeed Zenith by Stenovations. 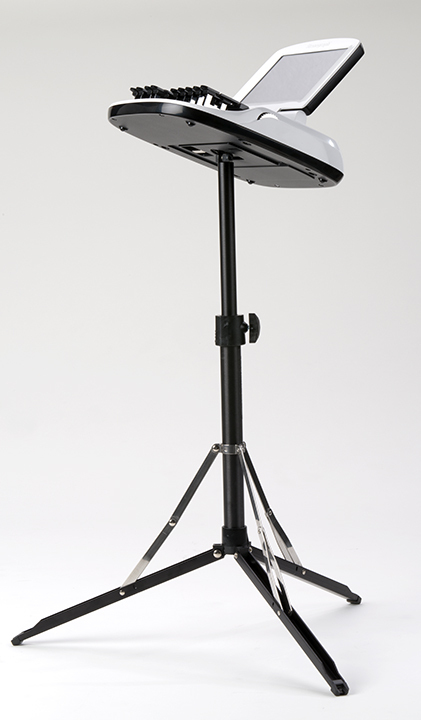 Some stenography machines offer one or more threaded holes or other kinds of mounting points, allowing them to be mounted to a tripod. This allows for more freedom in setting it up, and might allow for better ergonomical positioning. Some machines are split in two halves, trading some portability for improved ergonomics and flexibility. The Infinity Ergonomic by The Neutrino Group. 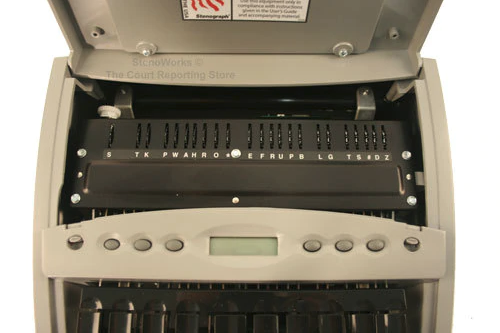 Some features are common to all stenography machines, while other features can be found more often in certain price ranges. Keep in mind that professional machines are often prohibitively expensive, so even the lower range starts from $500 in the secondhand market. Most machines look the same on the outside, sharing a basic feature set. They’re often single-piece designs, supporting at least the basic stenographic keymap, with lever-actuated keys. By means of one or more supported protocols, they send the keystrokes to a computer which translates it using software. At higher price points, features begin to differentiate the various models. Most often, machines start to be able to be used standalone, without the use of a computer. This allows to hook the machine up to a computer at a later moment to retrieve the files. Standalone machines differ in supported features too: basic machines can write text but can’t read it back to the user, while more advanced ones can even search through all text, providing (basic) steno translation capabilities on the machine itself. Other expensive features are different actuation mechanisms, key configurability, having a split machine and/or a tripod stand for better ergonomics, or various wireless capabilities. Stenographic machines are very specialized tools, intended for specialized professionals. It appears to be quite a small market, dominated by a handful of companies. This article highlighted commercial machines, available for commercial prices, having features that are often the same across machines. I’m completely new to stenography, and I’m just visiting out of curiosity. It seems as though most machines are quite old and aren’t updated frequently. Some machines do use more recent technologies such as bluetooth or wifi for connectivity, or use a plethora of sensors to provide for a completely customized experience, which to me seems to justify the steep prices somewhat better. I’ve only highlighted commercial machines, but there appear to be several community-made machines as well, as noted on Plover’s Supported Hardware page. These have a reduced feature set, but still comply with the basics and are very useful and affordable for learning and using stenography. I’d like to explore the existing community designs and see how much they differ from commercial machines, how they innovate and what they might still lack when compared to the machines in this post. Stenography is another way to input text. I’m interested in mechanical keyboards, and it’d be interesting to highlight the differences and similarities between keyboards and stenographic machines.